And speaking of Asians, my group of friends probably was the only Asians there. And I was the only Chinese there for sure. Nonetheless, very comtemporary style hotel and design. I have never stayed at the graves, but friends who have stayed all said very nice things about it. Especially, the alleged Hermes toiletry. And I had to ask him, "Did you secretly put them away each morning so they can fill in with new ones for the house-keeping?" Oh yea. Bradstreet Craftshouse was inspired by John Scott Bradstreet, who started his own entertainment business, including bars and clubs, in the early 1910s. Bradstreet lived a high life, and also died the same way. He allegedly died in a car accident, and became the first person in Minnesota to die in an automobile crash. What a life. The specialties are definitely their mixed drinks. I was recommended to the Bradstreet because of the Violent Hour in Chicago. Violent Hour's partner invested in Bradstreet, and has brought over the drink menu for the crowd in Minneapolis. Maybe if I do make it to the Violent Hour next time in Chicago, I'll be able to tell you more about the two. But V-H is one of those places that doesn't take any reservations, and you would have to spend an hour waiting in line before getting your first drink. With that being said, I actually would just stay in Minneapolis. At least Bradstreet is quite, nice and doesn't require you to stand in the line. 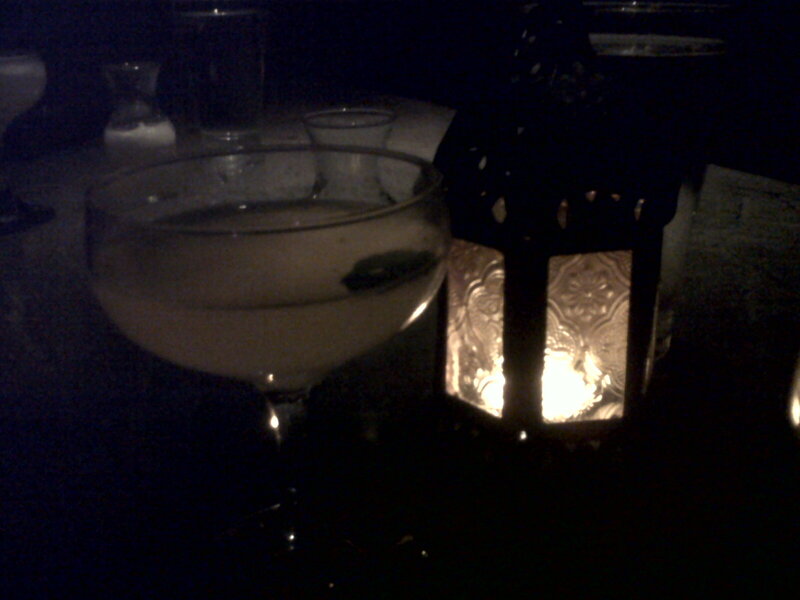 Juliet and Romeo: Plymouth, Gin, Mint, Cucumber, Lime and Rose Water. Very refreshing drink. Definitely a must try if you are a fan of gin. Or you should still try even if you are not a fan of gin. It's very smooth and just simply refreshing! Not much a dining menu, but very elegantly prepared appetizer menu. 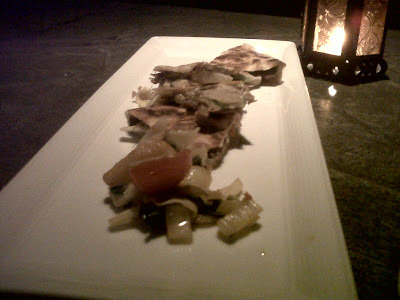 Quesadilla: Duck confit, racelet cheese and apple kimchi. Stuffed and served with the thin, crispy, grilled flour tortilla. It was just a very neat concept to put duck and kimchi (marinated cabbage or apple, in this case) into a tortilla. 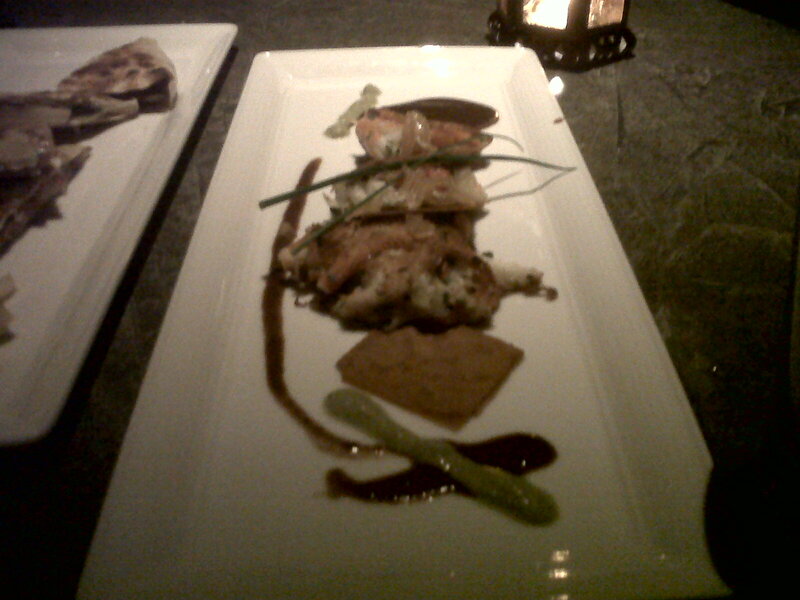 An interesting, surprising yet so balanced mix of flavors, textures and cuisines. Very well done. Crab cake: Not much to explain. Lumps of snow crab meat (lumps, not minced), served with cream and poblano coulis. A different kind of crab cake, a more pleasing type of crab cake. 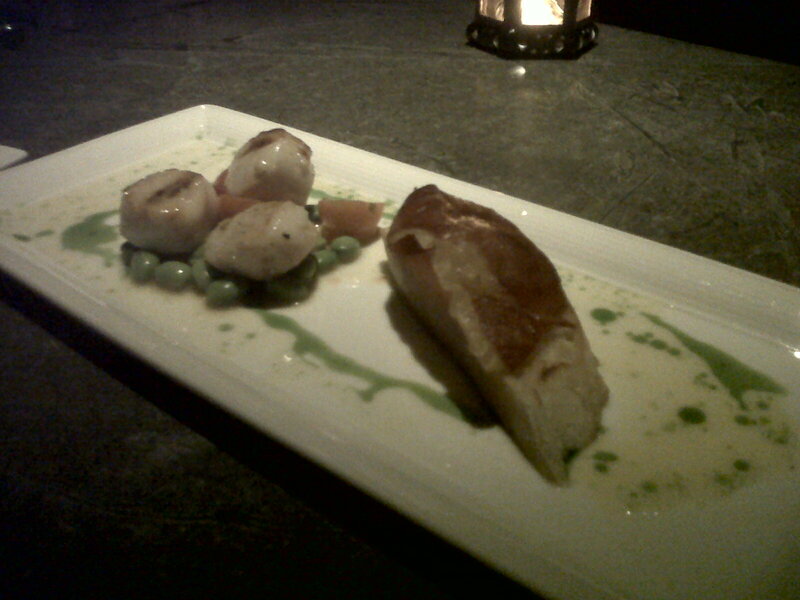 And of course, hanging with Ratree, we must have scallops. No matter if it's scallops at a sushi restaurant, scallops at Chino Latino, or here, Grilled Scallops at Bradstreet. Other food also sampled: Thai Chicken Satay and Calamari La Plancha. The chicken satay maybe soso, but the calamari was worth mentioning. Not battered or fried, but simply cooked with light mushroom and lemon sauce. Very appealing, fresh taste of the calamari without the batter, yet the lemon sauce was just right to kick out the fishy taste. Forgot to take pictures of those two dishes, and all the other numerous drinks we tried that night. I guess that glass of tequila El Diablo was really kicking in before I knew it. Definitely a very fun night. The atmosphere in Bradstreet might be a little bit more uptight and the crowd might be just a little bit too serious for us, but we sure knew how to have fun. Folks, I'm going on a de-tox program right now. No coffee, no alcohol and no processed food till April 15th. I just had been exploiting my body so much for the last couple months and I am starting to feel sick, and also, fat... I will not be going to fancy restaurants, but I'll for sure update some health food or what not. I also have visited plenty of restaurants from the past, and maybe can still post those reviews as updates. Either way, wish me luck on my detox weeks. I'm gonna feel like a million buck soon!! Sorry to burst your bubble, but it is pronounced like the tomb. Oh! Thanks for the comment, Kris, and I LOVE your blog!!! Thanks! We're just a couple of beer geeks that decided to share our drinking with others.